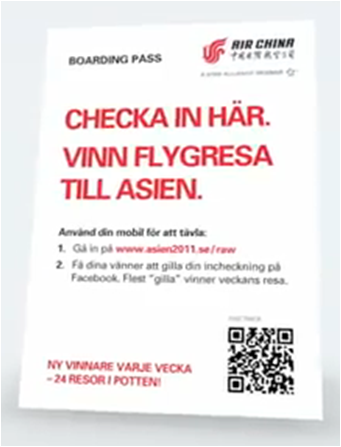 Air China have been using restaurant checkins on Facebook to raise awareness of the flights that they run to Asian destinations from Stockholm Arlanda airport. A leaderboard on Air China's Facebook Page then aggregated checkin's and each week two tickets to Asia were on offer for the Facebook user with the most votes. Whilst it is still based around a competition, this is an interesting / innovative way of generating awareness and Facebook engagement! The individuals can also change their e-mail address or their mobile number easily. adplogin.net The administrator is the only individual who could fix that issue to fix the problem. Sweepstakes can be gated to share user-generated content too. This way, your campaign can be a user-generated content marketing campaign. UGC campaigns are highly successful due to authenticity of content. UGC content can also be used in a variety of ways by a brand later, such as repurpose content etc.